Is this orange chiffon cake too good to be true? Gosh! I have to pinch myself when I cut the first slice of this cake. It is made with NO cream of tartar, baking powder or any cake raising agents and cake stabiliser! Yet, it shrinks very minimally. And, it is so soft and cottony!!! How did I create this cake? All based on my ultra-soft-chiffon-cake theories!!! LOL! Ultra-soft-chiffon-cake theories? They are mentioned before at here if you are interested. Knowing that I can't overload the liquidy orange juice into this cake, I have chosen to bake the cake with a balance amount of egg yolks and whites from the same number of eggs and at the same time, reducing the amount of gluten by having 40g cornflour in 120g total flour used. And YES... I have achieved the cut off point of applying my theories and yielded this PERFECT ultra soft orange chiffon cake! Yippee! It's a perfect cake with its fine cottony soft texture and so I can't say that I don't love it!!! I love it but I must say that the fine cottony cake is not as ultimately moist as these previous chiffon cakes that I have baked at here, here, here and here... because 1) my previous chiffon cakes at at here, here, here and here are baked with extra egg whites and boldly loaded with liquid ingredients. 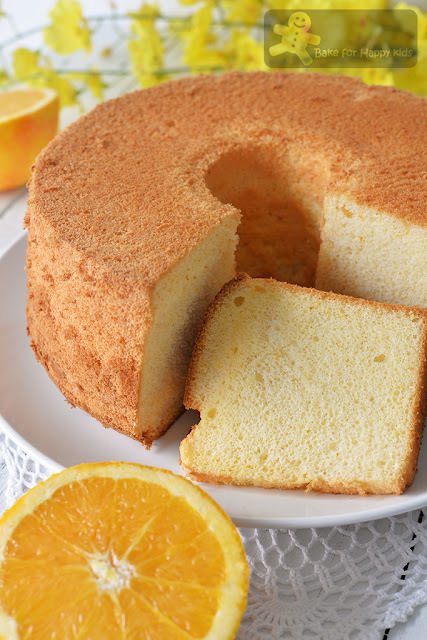 2) orange juice is acidic and this means that the acidity in the cake batter will make the egg proteins in the chiffon cake set faster and firmer than usual. So you know... Chiffon cake that is structurally stable and beautiful like this tends to be a little less moister. Hmmm... Sometimes, we just can't have the best of the both worlds. Love love love this cottony soft orange chiffon cake!!! I can't believe that every bit of this cake is so perfect!!! Want more ultra soft chiffon cake like this? 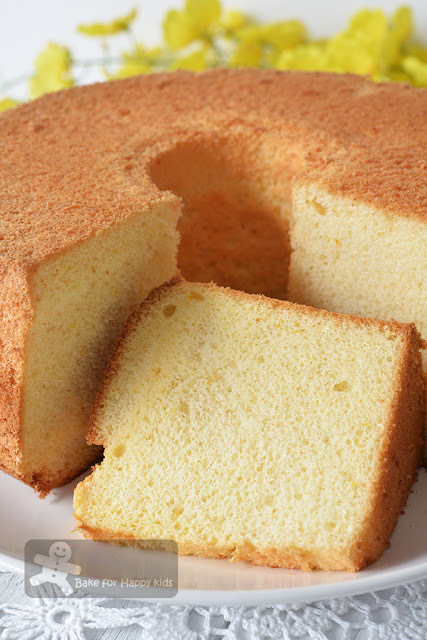 I will have many newly-derived ultra soft chiffon cake recipes to share in the near future and so please stay tune! I promise that all my chiffon cakes are specifically created with lots of loves and thoughts... LOL! And I hope that you will like them. To get the latest updates of my bakes, you can follow me at either my Facebook at here or here or my Instagram @zoebakeforhappykids. Here's a video showing how I baked this lovely cake and I hope that you will also bake and love this cake as much as I do. 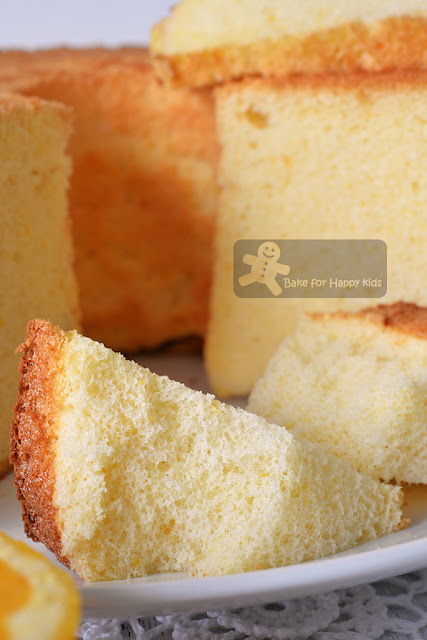 If you want to know more chiffon cake baking tips, please read here. Using a hand whisk, combine egg yolks and oil in a large mixing bowl until combined and slightly pale. Whisk in orange juice and orange zest. Sift in both flours and salt and whisk gently until the batter is smooth and combined. Pour batter into an un-greased 20 cm chiffon tube pan. Give the pan a gentle tap. Bake at 160°C for 55 mins or until it is thoroughly baked. IMPORTANT: This cake has to be baked for at least 50 mins in total. If the top of the cake is turning golden brown too quickly, cover it very loosely with a piece of foil at the last 15-20 mins of bake. wow I wish I could bake like that, to come up with how much egg for how much flour just like. when it comes to baking cakes especially I still need to have a recipe! Gorgeous Zoe! I've been dying to make an orange cake again! I'm keen on trying out a flourless almond orange cake though! Hi Zoe, my cake turned up exactly like yours however there is a 1cm thick lumpy below. What could be the reason? Maybe you didn't mix the batter well enough. Or your oven temp is too low? Hi Zoe, really appreciate the generous sharing of your successful recipes after many trial and error and research. I'm a big fan of your chiffon cakes recipes and have attained success in following them too! This morning I baked the orange chiffon cake using your recipe with my boy. It was good fun to bake together and savour our "fruit of labour". Thanks for your supportive comment. I'm happy that you like this recipe. May I know what is Corn Flour? Is that corn starch flour? In Aus, we called corn starch corn flour. It is the finely milled white flour that is made of corn starch. I am using a microwave oven , so, can I follow the 160 degree? Hi, Please do not use microwave convection oven to bake chiffon cake. The heating system is very different from the non-microwave top and bottom heating ovens. I tried the above but my cake did not raise like yours, its probably just rise to half ? What could be the reason ? Hi, There are many possibilities... 1) Your egg whites are not beaten properly. 2) Oven temp too low 3) Didn't bake long enough 4) over mixing the batter 5) please do not use microwave oven to bake this cake!!! Cheers! I tried it and turned out really well. Used a microwave oven with convection mode, baked at 170 for 10 minutes, reduced to 160 for the next 20 minutes and reduced further to 250 for the final 20 minutes. The cake rose nice and tall with ultra soft texture. Thank you for this fantastic recipe! The final temp is not 250 , right ? I think she meant 150 C. Cheers! Wow, I have make it....Thanks Zoe. My kids and i really like the cake...soft and fluffy. I follow exactly and it turn out so well! Thanks!